To provide a unified voice to promote the business, residential and recreational quality of life of the community. 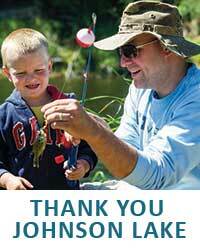 As with any chamber of commerce, the Johnson Lake Chamber will be financed by investment dues from its members. The goal is to make the Chamber fun, informative, results-oriented and most importantly, focused on providing benefit to its members. Johnson Lake Events Calendar - Find out what is happening at Johnson Lake! For more information about the chamber, please contact one of our Chamber Board Members here. Membership Directory - List of current Chamber Members. Membership Benefits - Learn why it's important to become a member of the Johnson Lake Area Chamber of Commerce. Membership Application - Adobe Acrobat Reader is needed to view this application.